Here’s one of the easiest ways I know to cook an serve a load of fresh mussels. We’re lucky to sometimes get mussels from our friends on Great Barrier who farm them – those are the fattest, tastiest and freshest mussels in the whole wide world, but even mussels from the supermarket are generally pretty okay. Just avoid any that don’t close when tapped, or that don’t open when cooked. To feed two adults and two children, I’d buy about 1.5 kilos of mussels. That’s about $5 something – mussels are really so cheap, and they’re a great source of iron and other nutrients as well as being super tasty in a deeply satisfying umami way. My four year-old daughter has been eating mussels since we first took her to the Barrier at 9 months old and the local shellfish we an instant hit her. I used to chop them into bite size pieces but these days she happily hoes into them whole, slurping up the juices with the shells. Firstly, in a small heavy frying pan, sauté some onion and garlic in butter until soft, about 10 minutes. 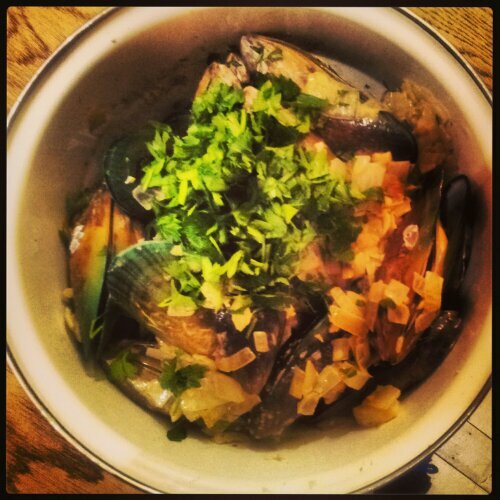 While that’s sautéing, put the whole mussels into the kitchen sink and cover with a little lukewarm water. This should encourage them to open just a little, so you can get in there and tear their beards out, while at the same time scrubbing the shells and rinsing with clean water. As you go, place the cleaned mussels into the cooking pot. I bought a nice blue enamel mussel pot with lid (both the pot and lid have handles) from the Wesley Community markets last year; it’s been great as you can pile the empty shells in the lid at the table. When you’ve cleaned all the mussels and placed in the cooking pot, pop the pot on the stovetop and add just a splash of water – maybe 1/2 cup. 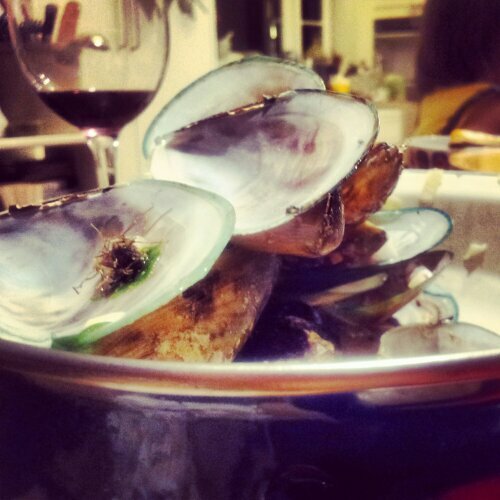 Don’t add any salt; the mussels have enough sea salt in them to make this dish salty enough. Turn the heat on and put the lid on, let the mussels steam for 4-5 minutes until they’re just cooked through. You might like to move them round using tongs once, to make sure all the mussels get cooked. Take the lid off and crumble about 3/4 of a 125g piece of blue cheese into the pot, stirring the small bits of cheese through the pot to distribute and melt. Pour in 1/4 cup white wine and the softened onion and garlic. Stir it all well and once the cheese has melted down, turn off the heat and serve garnished with freshly chopped flat-leaf parsley and lemon wedges to squeeze over. Thanks for the tip on warm water and getting the beards out. That is a handy tip to know. I always wrestle with those beards and they usually win.